One of the interesting sub-genres of the paper money hobby is collecting Obsolete Bank Notes. Simply put, these notes were issued by non-government sanctioned private banks to cover debts and payments in their respective locale. For example, the Saybrook Bank of the Connecticut shoreline issued its own currency at one point for use by its customers and area residents. This sort of “do-it-yourself” currency production was usually short lived. Once the Federal government began issuing currency – or more commonly, if the bank failed – these types of notes immediately lost value and were no longer legal tender. They became obsolete by virtue of the fact that they were completely useless. Fortunately for Obsolete Bank Note collectors, many specimens of this bygone banking era in the United States still exist. Some of the notes come in unusual denominations, such as $3 or $4 bills. For the most part, however, the standard $1, $2, $5, and $10 denominations are the most common surviving examples. Obsolete bank notes can be collected individually by bank like National Bank Notes, or by state. Some obsolete collectors enjoy pursuing uncut sheets of notes that never made it into public hands. These sheets command a higher premium on average compared to most other obsolete examples, except for true rarities that sometimes go for in excess of $1,000 when the hammer falls at major auctions. Obsolete Bank Notes for Sale – www.donckelly.com – Mr. Kelly is well known for his lifelong work in the National Bank Note side of USA paper money collecting. You can find a vast selection of Obsolete Bank Notes listed state-by-state at his website, ranging in value on average from $40-$1,000. One particular note from the Dakota Territory is unique and will set you back $17,500, but it is well worth the purchase price due to its extreme rarity! Heritage Auction Galleries Currency Archives – www.ha.com – Heritage Auctions’ archives are a great way to get market values for your Obsolete Notes. Heritage is one of the leading currency auctioneers in America, and chances are if you want to know the value of a note, they’ve probably sold it before. Archives go back as far as 2001. Michigan Bank Notes – www.kcshop.com – Love Michigan Obsoletes? Well look no further: KCShop.com has a wealth of notes available for purchase, in addition to offerings from several other states. Definitely worth a look! Georgia Obsolete Currency – www.davidmarsh.com – Mr. Marsh has a great website dedicated to Obsolete banknotes from Georgia. A new website feature lists some notes for sale. You can also find some great information about the currency hobby on this website. What is Obsolete Currency? – www.sellitstore.com – Want to know more in-depth information about the origins of Obsolete Currency? This website has an expansive page that covers all the basics of Obsolete Notes, including a good explanation about “counterfeit” and “spurious” notes, two types that one will come across while chasing various Obsolete notes. We hope you’ve enjoyed our brief look at Obsolete Currency. It’s an interesting field of the hobby that will only grow in the years to come as more and more collectors become curious about non-government banks that issued currency prior to the Civil War. If you would like to purchase or inquire about any of the notes listed above, please visit the website listed below the image, where you can contact dealers directly with your questions or want lists. 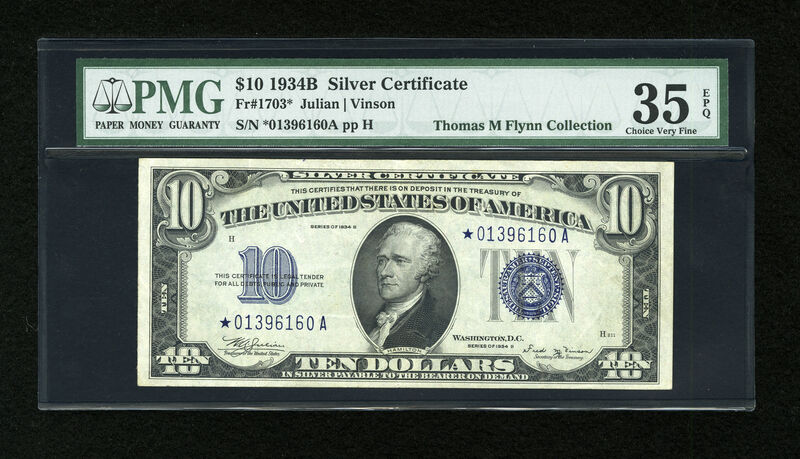 Pop quiz: name a rare $10 small size silver certificate? Immediately, most people would come up with the 1933 issue and 1934 North Africa Star Note, the “Holy Grail” of small sized collecting. There is, however, a nice mid range rarity for those that don’t have $20,000 plus to shell out for a rare North Africa star silver certificate. Introducing Fr. 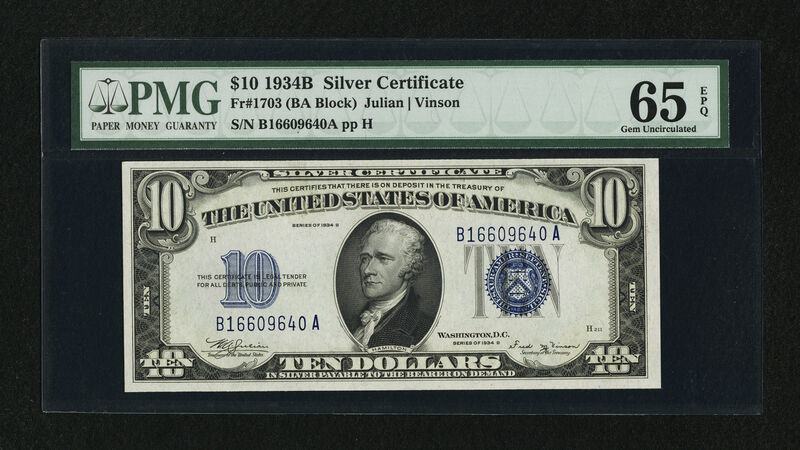 1703 1934B $10 Silver Certificate with signatures of Julian-Vinson. While its rarity doesn’t reach the stature of the aforementioned notes, it is certainly a highly desirable small size note that any serious collector should have in his or her collection. According to the Standard Guide Small-Size U.S. Paper Money (1928 to date) by Schwartz and Lindquist, a paltry 337,740 of the 1934B notes bearing Julian and Vinson’s signature were printed. All notes were on the B-A block. The guide has no definitive number for star note production, although it lists known ranges of *01 333 331A to *01 505 683A. Clearly, this note is a oft overlooked rarity that probably deserves greater attention. When in Uncirculated condition or better, prices exceed $2,000 for regular notes. Star notes in Uncirculated condition are a true rarity, with auction prices for About Uncirculated notes starting at $5,000 and upwards. In fact, in a Heritage Auctions event on February 18, 2005 a Gem Crisp Uncirculated star note example of this type went for $25,300 after a fight between 7 different bidders! After looking at these truly under appreciated rarities, you should definitely reassess your $10 Silver Certificate buying priorities. Put those 1934D Wide notes or 1934A Blue Seals on standby: it’s time to hunt down Julian and Vinson and get them in relocated into a prominent spot in your collection. Then, of course, you can make way for that 1934 Yellow Seal North Africa Star Note you’ve always wanted :). Images are copyright Heritage Auctions and used only to show examples of this note type. If you have any interest in purchasing the actual notes pictured above, please consult Heritage Auction Galleries for further information. You can also surf around our site and see if you can find one. Simply click “Buy $10 Notes” in the menu on the left, then “Buy $10 Small Size Silver Certificates” on the next page. Then it’s off to the races!